Why Dynamic Vapor Sorption (DVS) technique was invented? Dynamic Vapor Sorption or DVS is a gravimetric technique that measure how quickly and how much solvent is absorbed by a material or sample. It began in 1991 when Pfizer was looking for a technique that would characterize the solid-state materials of their excipients, drugs and tablets. Dr Daryl Williams (Reader in Particle Science at Imperial College London and founder of Surface Measurement Systems) then invented DVS and delivered the first instrument to Pfizer in 1993. This method replaced the classic jar or desiccator method that Pfizer was using. The DVS was 100 times faster, 100 time more accurate and used 100 times less sample than these classic methods. 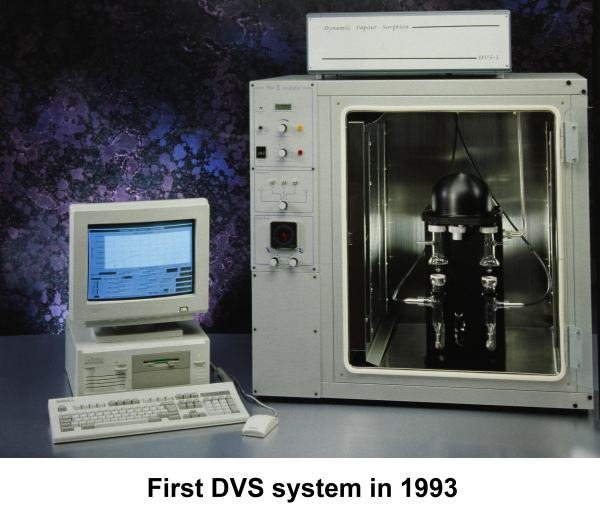 (Photo below: First DVS system in 1993). DVS measures the uptake and loss of moisture or organic vapours by flowing a carrier gas at a specified relative humidity (or partial pressure) over a sample (which can weigh between 1 mg and 1.5 gm) suspended from the weighing mechanism of an ultra-sensitive recording microbalance. Now, the technique is widely-used, not only, in pharmaceutical industry but also in the field of biomaterials, building materials, food, personal care, energy, agriculture, aerospace, catalysis, polymers and nano materials.